Searching For Emily Trailer from Kristina Campbell on Vimeo. 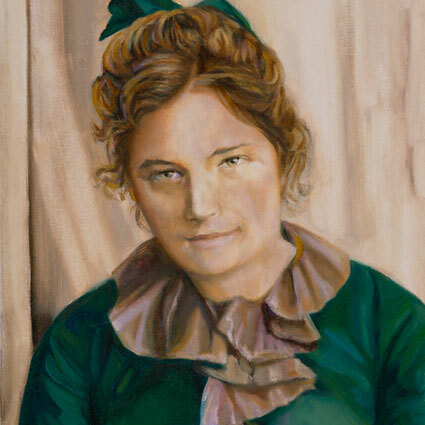 When I first learned of Emily Carr, I was immediately struck by two things: the bounty of work she produced and the portrayal of her as an eccentric frump. The latter dampened my enthusiasm for her work. Years later, I read her book Klee Wyck. Feeling like she was talking directly to me, I marvelled at the way she expressed herself. After that initial reading, in no time at all, I read all of her books. With each one, I continued to find yet another glimpse into Carr’s insight and courage. Then I steered to books that had been written about Carr, and saw the photos of her youthful years. I was shocked. Here were images of a beautiful young woman hardly ever – or never – seen by the public. Struck by a feeling of injustice for her, I wanted to give justice to woman and artist Emily Carr by painting these youthful images. Carr’s biographers most often credited the source of their photos to BC Archives. Eventually I went there and looked at every single image of Carr in their collection. There is no bigger archival record of images of Emily Carr than at BC Archives. I ordered almost every single photo of Carr in her youth. Much later, after speaking with Karl Schutz, I was persuaded to look at how I might portray the older Carr in a more dignified manner and so had further use of the Archives. I started painting The Green Dress in 2001 and proceeded to that of Small. Then I went on to other projects until 2008, when I felt the need to return to my crusading intent of years before. Completed in 2010, The Other Emily has evolved to become a portrait project whose final shape I had not foreseen. When I initially approached the Royal BC Museum and asked Director Tim Willis to view the first six works, his approval led to meeting Curator Kathryn Bridge, one of three premier experts on Carr. Bridge had always wanted to see Carr portrayed in a more holistic manner, so we were excited to feel that we might be able to redefine Emily Carr’s public image. Bridge’s expertise on the breadth of Carr’s life also began to influence my painting. She brought me books, a montage of photos chronicling a meeting between Carr and John Vanderpant, and material that I actually incorporated into one of the paintings: a photocopy of Richard’s only-surviving letter to his sister Emily, that I tore and collaged as part of the background for my painting entitled March 2nd. Independent filmmaker Kristina Campbell was a constant collaborator. For over a year, she documented me painting the works for The Other Emily and the meetings between Kathryn and myself and other Museum officials. She funded our trek to Haida Gwaii where we walked in Carr’s footsteps, and from all of this produced her documentary film, Searching for Emily. Artistically, I thought I would bring the black and white photos to life as colourful works of art. But the photos of Carr taken at the time of the turn of the 20th century, inspired me to make correlations between them and paintings from the Impressionists. At the onset of the project, I had no idea that I would be basing decisions of color, technique and emotion through the inspiration of works by Manet, Renoir, and then later on, Warhol and Picasso. So what started as a lone desire to alter the public view of Emily Carr, ended up as a deeper artistic exploration and a collaboration that has made The Other Emily a richer tapestry. The Other Emily shows at the Royal BC Museum March 2 to October 10, 2011. The Other Emily E-Book is now available via Amazon.com!